When the twins were babies, I was grocery shopping one day, and checking out the laundry detergent aisle. I saw Purex baby laundry detergent , and decided to give it a try. I LOVED IT!! At the time we had a small, apartment size washer so I did laundry every other day, in smaller loads. I stopped using this detergent as our family grew and we had more laundry, as it came in only small containers and it was cheaper for our family to buy a larger bottle of detergent that lasted longer for that time. I was recently given the opportunity to review a bottle of Purex baby laundry detergent as Purex Insider, and was so excited to try this new and improved Purex Baby! As soon as I got it, the first thing I did was open the cover to take a whiff. It has the same smell I remember from using it all the time before. I LOVE the pleasant smell it has and also love that it's gentle on infant and kid's skin. Merasia has very, very dry skin and Mason occasionally has sensitive skin, so it's always a little tricky to find detergents or soaps we can use for everyday baths or laundry. Another new thing with Purex Baby is that it's triple action, so it cleans even better than before...if that's even possible because it worked amazing before too! I don't have any before or after shots to prove just how good this detergent works, as I did my laundry at the laundromat recently, but the clothes came out looking and smelling just as good as they do when I use our normal detergent (which is another Purex detergent, by the way.) ;-) Tough on those baby stains AND it smells great? You cannot go wrong! Purex Baby is not just for baby and children's clothing though. When I used to buy it, I would wash all of our clothes in it, and I did the same thing this time around. I figure if it's good enough for our children's clothing, it's good enough for ours too! I have always had sensitive skin, so using it on my clothes is only going to benefit me in the end! Many soaps, baby wipes, or detergents on the market today that are hypoallergenic do not have any scent to them or at least not a pleasant one, but Purex Baby is the exact opposite. I wish I could send all of you a preview of what it smells like to see for yourselves! 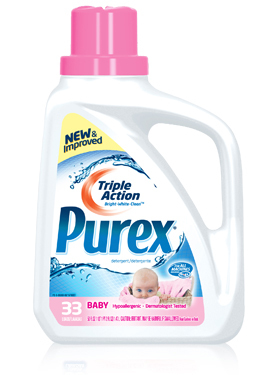 Now that we don't do laundry as often as we used to have to, the price of Purex Baby is unbeatable and it goes a long way! Purchase it: You can purchase Purex Baby laundry detergent at a grocery store near you! WIN IT: THREE lucky readers of Mama 2 Multiples are going to WIN a coupon for a FREE BOTTLE of Purex Baby Laundry Detergent! To enter, simply follow the instructions in the giveaway form below!